So here it is... I think this is my fave. I haven't done so many valentine's day manicures in my life but still, this is the one I prefer of them all. I just adore how it turned out! It is not something out of this world, but sometimes I think simple things can be beautiful! So to get into details, I first went on with Bio Seaweed Gel's 3Step colour ''Sweetie'' and gave it two coats (Also used their Stronger base and No-Wipe top). As you can see on the image on the left, I could have left it like that and it would have been beautiful but y'all know how much I like stamping! 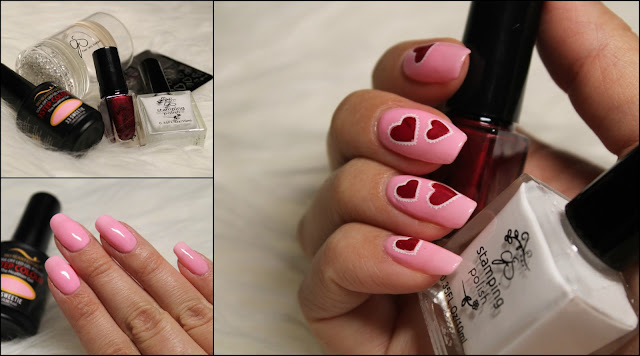 Anyways, hope you liked this cute little V day mani!